Ever heard of ‘Khalifa therapy’? Mohamed Khalifa is a therapist who works in Austria and has been practicing manual therapy for more than 30 years. His treatment, the so-called “Khalifa therapy”, is based on rhythmically applying manual pressure on parts of the body. Khalifa claims to be able to speed the self-healing processes of the human body. He has treated many top-athletes from all over the world; however, his method has never been investigated in detail within interdisciplinary scientific studies. Now the first RCT of Khalifa therapy has become available. Rupture of the anterior cruciate ligament (ACL) is an injury which usually needs to be treated surgically. It does not heal spontaneously, although some claim this commonly accepted knowledge to be not true. This randomized, controlled, observer-blinded, multicentre study was performed to test the effectiveness of Khalifa therapy for ACL. Thirty patients with complete ACL rupture, magnetic resonance imaging (MRI) verified, were included. Study examinations (e.g., international knee documentation committee (IKDC) score) were performed at inclusion (t 0). Patients were randomized to receive either standardised physiotherapy (ST) or additionally 1 hour of Khalifa therapy at the first session (STK). Twenty-four hours later, study examinations were performed again (t 1). Three months later control MRI and follow-up examinations were performed (t 2). Initial status was comparable between both groups. There was a highly significant difference of mean IKDC score results at t 1 and t 2. After 3 months, 47% of the STK patients, but no ST patient, demonstrated an end-to-end homogeneous ACL in MRI. Clinical and physical examinations were significantly different in t 1 and t 2. ACL healing can be improved with manual therapy. Physical activity could be performed without pain and nearly normal range of motion after one treatment of specific pressure. The authors of this study concluded that spontaneous healing of ACL rupture is possible within 3 months after lesion, enhanced by Khalifa therapy. The effect sizes of 1.6 and 2.0 standard deviations after treatment and after 3 months are considerable and prompt further work. Further progress in understanding the underlying mechanisms including placebo will be possible when more experience with the manual pressure therapy has been gathered by other therapists. Observations on 14 patients with ACL, for instance, indicated an acutely injured ACL may eventually spontaneously heal without using an extension brace, allowing return to athletic activity. Another study suggested that an acutely injured ACL has healing capability. It also suggests that conservative management of the acute ACL injury can yield satisfactory results in a group of individuals who have low athletic demands and continuous ACL on MRI, provided the patients are willing to accept the slight risk of late ACL reconstruction and meniscal injury. So yes, the authors of the new RCT are correct in stating: spontaneous healing of ACL rupture is possible within 3 months … but the healing might indeed be SPONTANEOUS, i.e. unrelated to the Khalifa therapy. Before we can accept that Khalifa therapy is anything but a theatrical placebo, this RCT needs independent replication. Generally speaking, it seems a bad idea to make exaggerated claims on the basis of one single trial, particularly for treatments that are as implausible as this one. Homeopathy is a deeply puzzling subject for many observers. Perhaps it gets a little easier to understand, if we consider the three main perspectives on homeopathy. For the purpose of this post, I take the liberty of exaggerating, almost caricaturizing, these perspectives in order to contrast them as clearly as possible. Sceptics take a brief look at the two main assumptions which underpin homeopathy (like cures like and potentiation/dilution/water memory) and henceforward are convinced that homeopathic remedies are pure placebos. Homeopathy flies in the face of science; if homeopathy is right, several laws of nature must be wrong, they love to point out. As this is most unlikely, they reject homeopathy outright, usually even without looking in any detail at what homeopaths consider to be evidence in support of their trade. If sceptics are forced to consider a positive study of homeopathy, they know before they have seen it that its results are wrong – due to an error caused by chance, faulty study design or fabrication. The sceptics’ conclusion on homeopathy: it is a placebo-therapy, no doubt about it; and further investment into research is a waste of scarce resources which must be stopped. The believers in homeopathy know from experience that homeopathy works. They therefore feel that they have no choice but to reject almost every word the sceptics might tell them. They cling on to the gospel of Hahnemann and elaborate on the modern but vague theories that might support the theoretical assumptions of homeopathy. They point to positive clinical trials and outcome studies, to 200 years of experience, and to the endorsement of homeopathy by VIPs. When confronted with the weaknesses of their arguments, they find even weaker ones, such as ‘much of conventional medicine is also not based on good evidence, and the mechanism of action of many mainstream drugs is also not fully understood’. Alternatively, they employ the phoniest argument of them all: ‘even if it works via a placebo effect, it still helps patients and therefore is a useful therapy’. When even this fails, they tend to resort to ad hominem attacks against their opponents. The believers’ conclusion on homeopathy: it is unquestionably a valuable type of therapy regardless of what anyone else might say; research is merely needed to confirm their belief. The perspective of EBM-advocates is pragmatic; they simply say: “show me the evidence!” If the majority of the most reliable clinical trials of homeopathic remedies (or anything else) suggests an effect beyond placebo, they conclude that they are effective. If that is not the case, they doubt the effectiveness. If the evidence is highly contradictory or incomplete, they are likely to advocate more rigorous research. Advocates of EBM are usually not all that concerned by the lack of plausibility of the interventions they evaluate. If it works, it works, they think – and if a plausible mechanism is currently not available, it might be found in due course. The advocates of EBM have no preconceived ideas about homeopathy. Their conclusion on homeopathy goes exactly where the available best evidence leads them. In other words, two of the three principal perspectives have now drawn conclusions which are virtually identical: there is a consensus between the EBM-advocates and the sceptics. This isolates the believers and renders their position no longer tenable. If we furthermore consider that the believers are heavily burdened with obvious conflicts of interest, while the other two groups are by definition much more independent and objective, it appears more and more as though homeopathy is fast degenerating into a cult characterised by the unquestioning commitment and unconditional submission of its members who are too heavily brain-washed to realize that their fervour has isolated them from the rational sections of society. And a cult is hardly what we need in heath care, I should think. It seems to me therefore that these intriguing developments might finally end the error that homeopathy represented for nearly 200 years. Recently, I have been invited by the final year pharmacy students of the ‘SWISS FEDERAL INSTITUTE OF TECHNOLOGY ZURICH‘ to discuss alternative medicine with them. The aspect I was keen to debate was the issue of retail-pharmacists selling medicines which are unproven or even disproven. Using the example of homeopathic remedies, I asked them how many might, when working as retail-pharmacists, sell such products. About half of them admitted that they would do this. In real life, this figure is probably closer to 100%, and this discrepancy may well be a reflection of the idealism of the students, still largely untouched by the realities of retail-pharmacy. In our discussions, we also explored the reasons why retail-pharmacists might offer unproven or disproven medicines like homeopathic remedies to their customers. The ethical codes of pharmacists across the world quite clearly prohibit this – but, during the discussions, we all realised that the moral high ground is not easily defended against the necessity of making a living. So, what are the possible motivations for pharmacists to sell bogus medicines? One reason would be that they are convinced of their efficacy. Whenever I talk to pharmacists, I do not get the impression that many of them believe in homeopathy. During their training, they are taught the facts about homeopathy which clearly do not support the notion of efficacy. If some pharmacists nevertheless were convinced of the efficacy of homeopathy, they would obviously not be well informed and thus find themselves in conflict with their duty to practice according to the current best evidence. On reflection therefore, strong positive belief can probably be discarded as a prominent reason for pharmacists selling bogus medicines like homeopathic remedies. Another common argument is the notion that, because patients want such products, pharmacists must offer them. When considering it, the tension between the ethical duties as a health care professional and the commercial pressures of a shop-keeper becomes painfully obvious. For a shop-keeper, it may be perfectly fine to offer all products which might customers want. For a heath care professional, however, this is not necessarily true. The ethical codes of pharmacists make it perfectly clear that the sale of unproven or disproven medicines is not ethical. Therefore, this often cited notion may well be what pharmacists feel, but it does not seem to be a valid excuse for selling bogus medicines. A variation of this theme is the argument that, if patients were unable to buy homeopathic remedies for self-limiting conditions which do not really require treatment at all, they would only obtain more harmful drugs. The notion here is that it might be better to sell harmless homeopathic placebos in order to avoid the side-effects of real but non-indicated medicines. In my view, this argument does not hold water: if no (drug) treatment is indicated, professionals have a duty to explain this to their patients. In this sector of health care, a smaller evil cannot easily be justified by avoiding a bigger one; on the contrary, we should always thrive for the optimal course of action, and if this means reassurance that no medical treatment is needed, so be it. An all too obvious reason for selling bogus medicines is the undeniable fact that pharmacists earn money by doing so. There clearly is a conflict of interest here, whether pharmacists want to admit it or not – and mostly they fail to do so or play down this motivation in their decision to sell bogus medicines. Often I hear from pharmacists working in large chain pharmacies like Boots that they have no influence whatsoever over the range of products on sale. This perception mat well be true. But equally true is the fact that no health care professional can be forced to do things which violate their code of ethics. If Boots insists on selling bogus medicines, it is up to individual pharmacists and their professional organisations to change this situation by protesting against such unethical malpractice. In my view, the argument is therefore not convincing and certainly does not provide an excuse in the long-term. While discussing with the Swiss pharmacy students, I was made aware of yet another reason for selling bogus medicines in pharmacies. Some pharmacists might feel that stocking such products provides an opportunity for talking to patients and informing them about the evidence related to the remedy they were about to buy. This might dissuade them from purchasing it and could persuade them to get something that is effective instead. In this case, the pharmacist would merely offer the bogus medicine in order to advise customers against employing it. This strategy might well be an ethical way out of the dilemma; however, I doubt that this strategy is common practice with many pharmacists today. With all this, we should keep in mind that there are many shades of grey between the black and white of the two extreme attitudes towards bogus medicines. There is clearly a difference whether pharmacists actively encourage their customers to buy bogus treatments (in the way it often happens in France, for instance), or whether they merely stock such products and, where possible, offer responsible, evidence-based advise to people who are tempted to buy them. At the end of the lively but fruitful discussion with the Swiss students I felt optimistic: perhaps the days when pharmacists were the snake-oil salesmen of the modern era are counted? There is much debate about the usefulness of chiropractic. Specifically, many people doubt that their chiropractic spinal manipulations generate more good than harm, particularly for conditions which are not related to the spine. But do chiropractors treat such conditions frequently and, if yes, what techniques do they employ? This investigation was aimed at describing the clinical practices of chiropractors in Victoria, Australia. It was a cross-sectional survey of 180 chiropractors in active clinical practice in Victoria who had been randomly selected from the list of 1298 chiropractors registered on Chiropractors Registration Board of Victoria. Twenty-four chiropractors were ineligible, 72 agreed to participate, and 52 completed the study. Each participating chiropractor documented encounters with up to 100 consecutive patients. For each chiropractor-patient encounter, information collected included patient health profile, patient reasons for encounter, problems and diagnoses, and chiropractic care. Data were collected on 4464 chiropractor-patient encounters between 11 December 2010 and 28 September 2012. In most (71%) cases, patients were aged 25-64 years; 1% of encounters were with infants. 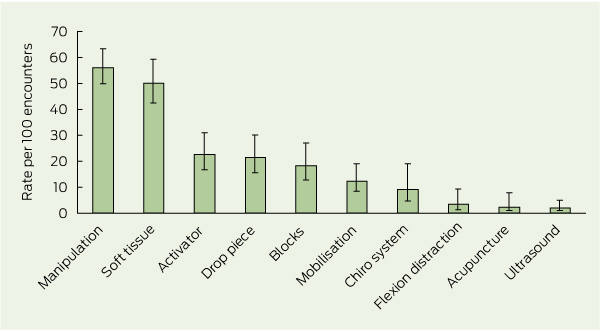 Musculoskeletal reasons for the consultation were described by patients at a rate of 60 per 100 encounters, while maintenance and wellness or check-up reasons were described at a rate of 39 per 100 encounters. Back problems were managed at a rate of 62 per 100 encounters. [Activator = hand-held spring-loaded device that delivers an impulse to the spine. Drop piece = chiropractic treatment table with a segmented drop system which quickly lowers the section of the patient’s body corresponding with the spinal region being treated. Blocks = wedge-shaped blocks placed under the pelvis. There is no good evidence I know of demonstrating these techniques to be effective for the majority of the conditions listed in the above table. A similar bone of contention is the frequent use of ‘maintenance’ and ‘wellness’ care. The authors of the article comment: The common use of maintenance and wellness-related terms reflects current debate in the chiropractic profession. “Chiropractic wellness care” is considered by an indeterminate proportion of the profession as an integral part of chiropractic practice, with the belief that regular chiropractic care may have value in maintaining and promoting health, as well as preventing disease. The definition of wellness chiropractic care is controversial, with some chiropractors promoting only spine care as a form of wellness, and others promoting evidence-based health promotion, eg, smoking cessation and weight reduction, alongside spine care. A 2011 consensus process in the chiropractic profession in the United States emphasised that wellness practice must include health promotion and education, and active strategies to foster positive changes in health behaviours. My own systematic review of regular chiropractic care, however, shows that the claimed effects are totally unproven. One does not need to be overly critical to conclude from all this that the chiropractors surveyed in this investigation earn their daily bread mostly by being economical with the truth regarding the lack of evidence for their actions. Not for a single health conditions was there reliable evidence that homeopathy was effective. No rigorous studies reported either that homeopathy caused greater health improvements than a placebo, or that homeopathy caused health improvements equal to those of another treatment. The overview considered a total of 57 systematic reviews that assessed the effectiveness of homeopathy for 61 different health conditions. vein problems due to cannulas in people receiving chemotherapy. The authors of the report now invite comments from interested parties. This means that homeopaths across the world can submit evidence which they feel has been ignored. It will be fascinating to see whether this changes the conclusion of the NHMRC’s assessment. It is almost 10 years ago that Prof Kathy Sykes’ BBC series entitled ALTERNATIVE MEDICINE was aired. I had been hired by the BBC as their advisor for the programme and had tried my best to iron out the many mistakes that were about to be broadcast. But the scope for corrections turned out to be narrow and, at one stage, the errors seemed too serious and too far beyond repair to continue with my task. I had thus offered my resignation from this post. Fortunately this move led to some of my concerns being addressed after all, and they convinced me to remain in post. The first part of the series was on acupuncture, and Kathy presented the opening scene of a young women undergoing open heart surgery with the aid of acupuncture. All the BBC had ever shown me and asked me to advise on was the text – I had never seen the images. Kathy’s text included the statement that the patient was having the surgery “with only needles to control the pain.” I had not objected to this statement in the firm belief that the images of the film would back up this extraordinary claim. As it turned out, it did not; the patient clearly had all sorts of other treatments given through intra-venous lines and, in the film, these were openly in the view of Kathy Sykes. This overt contradiction annoyed not just me but several other people as well. One of them was Simon Singh who filed an official complaint against the BBC for misleading the public, and eventually won his case. The notion that acupuncture can serve as an alternative to anaesthesia or other surgical conditions crops up with amazing regularity. It is important not least because is often used as a promotional tool with the implication that, IF ACUPUNCTURE CAN ACHIVE SUCH DRAMATIC EFFECTS, IT MUST BE AN INCREDIBLY USEFUL TREATMENT! It is therefore relevant to ask what the scientific evidence tells us about this issue. This was the question we wanted to address in a recent publication. Specifically, our aim was to summarise recent systematic reviews of acupuncture for surgical conditions. So, Kathy Sykes’ comment was misguided in more than just one way: firstly, the scene she described in the film did not support what she was saying; secondly, the scientific evidence fails to support the notion that acupuncture can be used as an alternative to analgesia during surgery. This story has several positive outcomes all the same. After seeing the BBC programme, Simon Singh contacted me to learn my views on the matter. This prompted me to support his complaint against the BBC and helped him to win this case. Furthermore, it led to a co-operation and friendship which produced our book TRICK OR TREATMENT. Homeopathy: benefit of the doubt or doubt of the benefit? As promised in the last post, I will try to briefly address the issues which make me uncomfortable about the quotes by Anthony Campbell. Readers will recall that Campbell, an ex-director of what was arguably the most influential homeopathic hospital in the world and a long-time editor of the journal HOMEOPATHY, freely admitted that homeopathy was unproven and its effects were most likely not due to any specific properties of the homeopathic remedies [which are, in fact, pure placebos] but largely rely on non-specific effects. Why on earth should scientists waste their time and resources on testing notions which are clearly bonkers? It is hard to imagine research that is less fruitful than such an endeavour. Disproving homeopathy [or similarly ridiculous treatments] is a near impossibility. Proving a negative is rarely feasible in science. In the best interest of patients, responsible health care has to follow an entirely different logic: we must consider any treatment to be unproven, while it is not supported with reasonably sound evidence for effectiveness; and in clinical routine, we employ mostly such treatments which are backed by sound evidence, and we avoid those that are unproven. In other words, whether homeopathy or any other medicine is unproven or disproven is of little practical consequence: we try not to use either category. While I applaud Campbell’s candid judgement regarding the lack of effectiveness of homeopathic remedies, I feel the need to finish his conclusion for him giving it a dramatically different meaning: Homeopathy has not been proved to work but neither has it been conclusively disproven; this means that, until new evidence unambiguously demonstrates otherwise, we should classify homeopathy as ineffective – and this, of course, applies not just to homeopathy but to ALL unproven interventions.